Professional Carpet Cleaning - Manor House, Wigan. It can be difficult to find a Professional Carpet Cleaning service no matter where you are in Wigan. Rest assured Manor House Carpet & Upholstery Cleaning are professional and we have the training, experience and feedback to show for it. Manor House Carpet and Upholstery Cleaning staff have all taken part in and passed an extensive array of training in carpet and upholstery cleaning, all qualified by the NCCA (National Carpet Cleaners Association). The training covers many aspects of carpet and upholstery cleaning from the types of fabrics and finishes you would see in many homes right through to more specialist fabrics and finishes. As part of the extensive training we’ve undertaken over the many years of trading we’ve also complete courses in the protection of fabrics and removal of more stubborn stains on delicate fabrics. As a member of the National Carpet Cleaners Association you can rest assured all Manor House work is carried out with the utmost of care and in accordance to NCCA recommendations. Great Feedback provides added peace of mind. Manor House Carpet and Upholstery Cleaning are part of the Wigan Trading Standards Good Trader Scheme meaning the standard of our work is reviewed regularly by verified customers. The reviews received from customers are monitored by Trading Standards and bench mark Manor House on three main criteria Customer Service, Quality of Work/Service, Punctuality / Efficiency / Time Taken. The three ratings then provide an average overall of rating for our service. 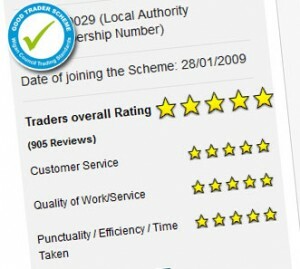 We’re proud to receive superb ratings from our customers ensuring our Traders Overall Rating is 5/5. It’s a sure sign for all potential new customers that Manor House not only work hard to provide a superb professional carpet cleaning service but our customers think we achieve it in every way. Great ratings, training and membership to a national organisation is only part of why Manor House are a professional carpet cleaning service. Another significant part of our professional service is our cast iron guarantee on our work. The guarantee is simple. If you are not happy with our work, we will re-do it for FREE. We’ll give you 30 days to call me back and fix it with no hassle or charge. Nothing is more important to us than your complete and total satisfaction. A complete service from start to finish. No matter what you need cleaning from carpets to upholstery Manor House provide a professional and complete service from start to finish. All backed by qualifications, experience, great feedback all supported by our money back guarantee.